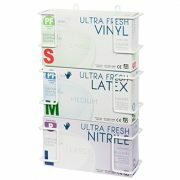 Single or Three Tiered Examination Glove Dispensers made out of Mild Steel and white powder coating. Single Tier Size: 24cm (W) x 8cm (D). Three Tier Size: 24cm (W) x 8cm (D) x 35cm (H).